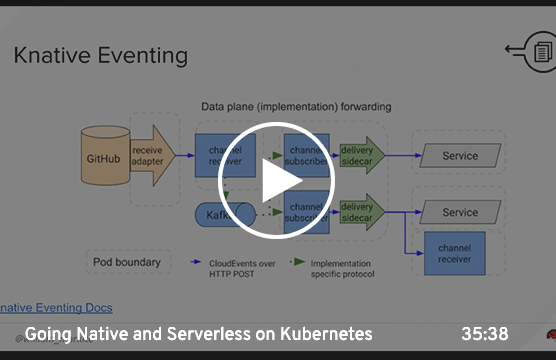 Knative extends Kubernetes to provide components for building, deploying, and managing serverless applications. Build serverless applications that run wherever you need them—on-premise or on any cloud—with Knative and OpenShift. Provides a pluggable model for building containers for serverless applications from source code. Uses Kubernetes and Istio to rapidly deploy, network, and automatically scale serverless workloads. Common infrastructure for consuming and producing events to stimulate applications. Use Kubernetes and OpenShift to build, scale and manage serverless applications in any cloud, on-premise, or in a hybrid environment. Build modern, serverless functions and support legacy apps through event sources. Manage them alongside your other applications on Red Hat OpenShift. With little or no infrastructure to set up, Knative allows app teams to focus on building products. Knative installs on OpenShift using Operators, simplifying installation and automating updates and management for Day 2 operations. Knative uses Kubernetes to help gain greater consistency and more granular scalability across applications and teams. Get started building, deploying, and scaling serverless applications with Knative and Red Hat OpenShift. Get started building, configuring, and managing serverless applications with Knative, Kubernetes, and Red Hat OpenShift—this series covers everything you need to know, from basic concepts to building and deploying services through Knative Build and Knative Serving. In-browser, guided tutorials on serverless workloads, from concept to execution. No downloads or sign-ups required. Learn how to build and deploy a serverless service to Knatve.